My flight is American #216 and is booked to arrive in Boston at 10:55. Just hope Lake Central is on time so will be able to make connections in Chicago. Should leave here at 7:25 AM and arrive in Chicago at 7:05 – since they are on Central and we are on Eastern I will get there before I leave here. We have been told that Lake Central is not reliable as to schedule, so am hoping I will not have to call you from Chicago telling you I will be on a later flight. I have a friend here (Conference President) who is standing by in case I need a ride to Indianapolis or Chicago to get a plane. Now that Thanksgiving is over have a few things to do before I leave for 10 days, so must get busy. Hope to see you Thursday at 10:55 or at about that time. 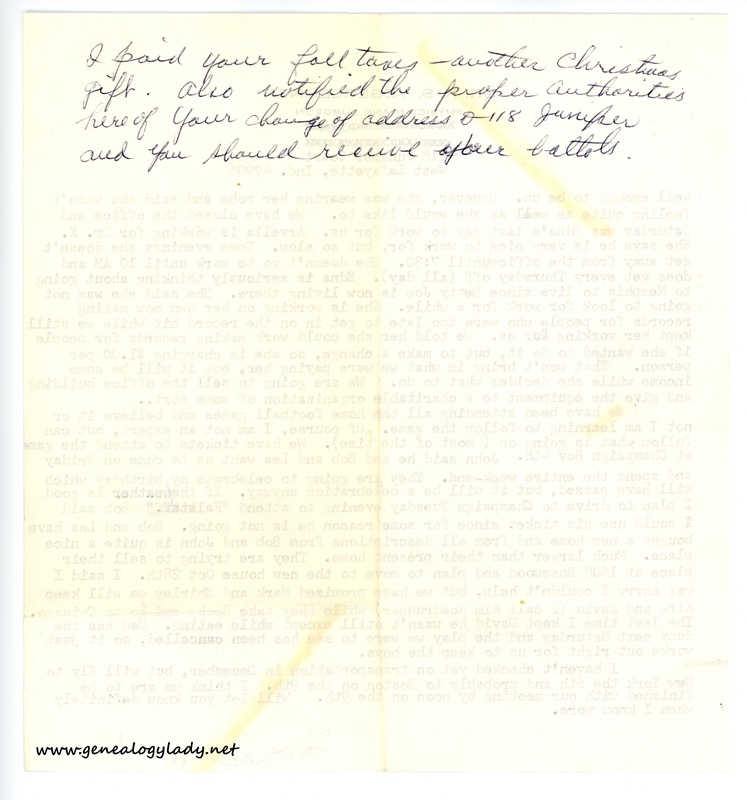 This entry was posted in Genealogy, Yegerlehner and tagged 1960s, Boston, Boston University School of Theology, David A. Yegerlehner, genealogy, Gladys R. (Foster) Yegerlehner, Indiana, Lafayette, Massachusetts on April 13, 2017 by Deborah Sweeney. 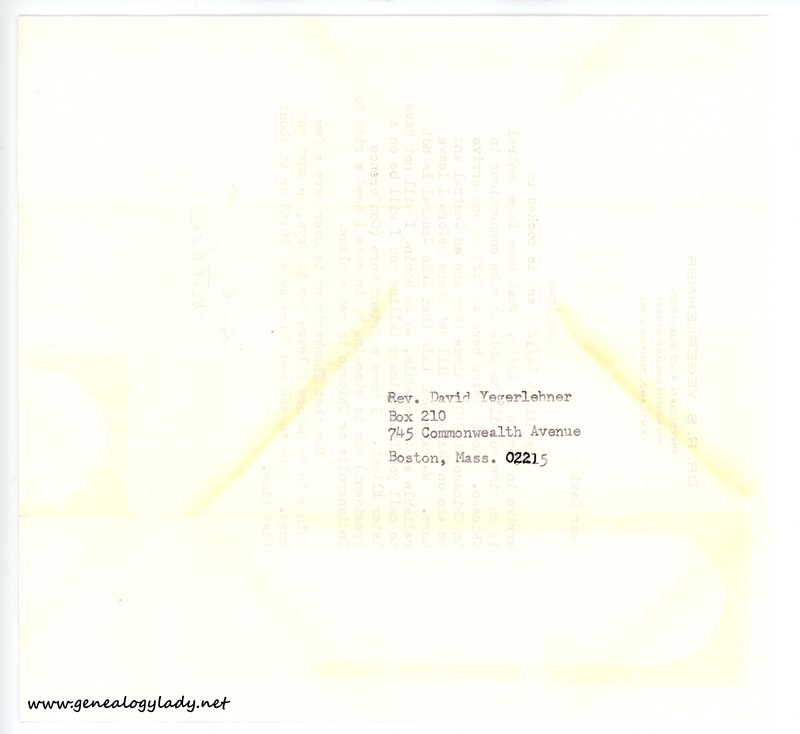 Your correspondence cards have been ordered – 200 and they will read Rev. 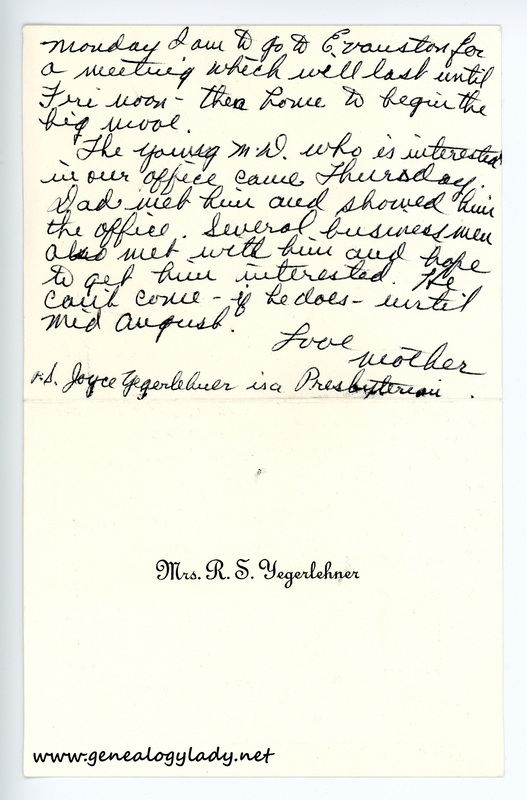 and Mrs. David A. Yegerlehner, and it is a good thing there wasn’t another letter, because that was as many as could be printed on this type of card. You can consider that part of your Christmas from us. I ordered and gave them your address, so the boxes (2) will come directly to you. John came over Friday and spent the weekend with us. He had an appointment with the eye specialists on Saturday. Saturday night we attended a play at Loeb’s Theatre – The Miser. It was quite interesting (have you read the play by Moliere?) and we thought the Purdue players executed it very well. 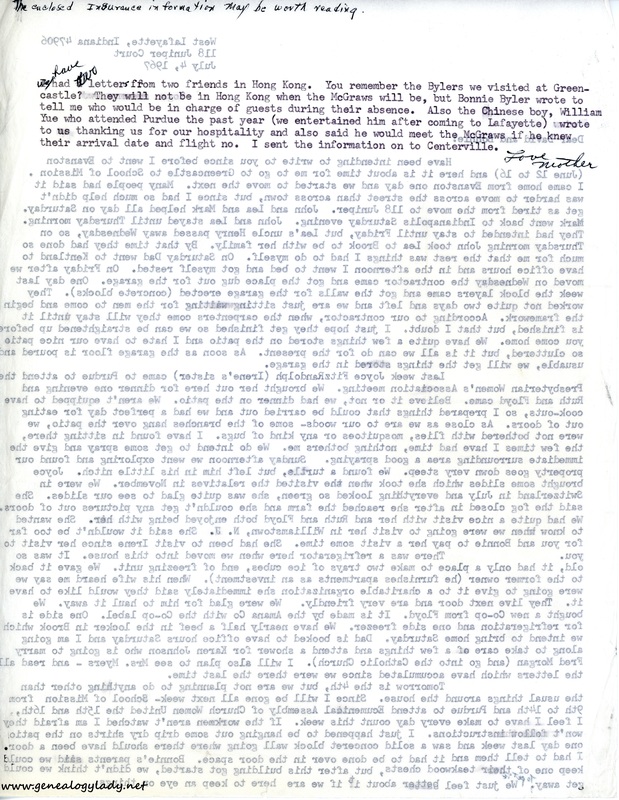 One of Dr. Schoonveld’s sons – Mike – had a bit part. He is a freshman this year. John left after breakfast this morning. Said he had so much work to do he should not have come Friday. We attended church this morning and have spent the rest of the day relaxing. Dad is watching TV now, but the program wasn’t very interesting, so I decided to catch up on my writing. Last week I attended a meeting in Cedar Rapids, Iowa, which for all practical purposes took most of the week – Tues. thru Friday. That was the week of Oct. 10 and this immediate past week I entertained the Vesper Circle from Kentland and on Thursday night a bridge group – Johnsons, Fords and McClures. Everyone was quite interested in seeing our place. We are bit by bit getting things finished, but still have quite a few things to do. We did finally get the driveway and retaining walls finished. Now we want to get our Japanese gardens completed, but it seems we don’t make as much progress as we would like to make – between Dad’s work and my running around. 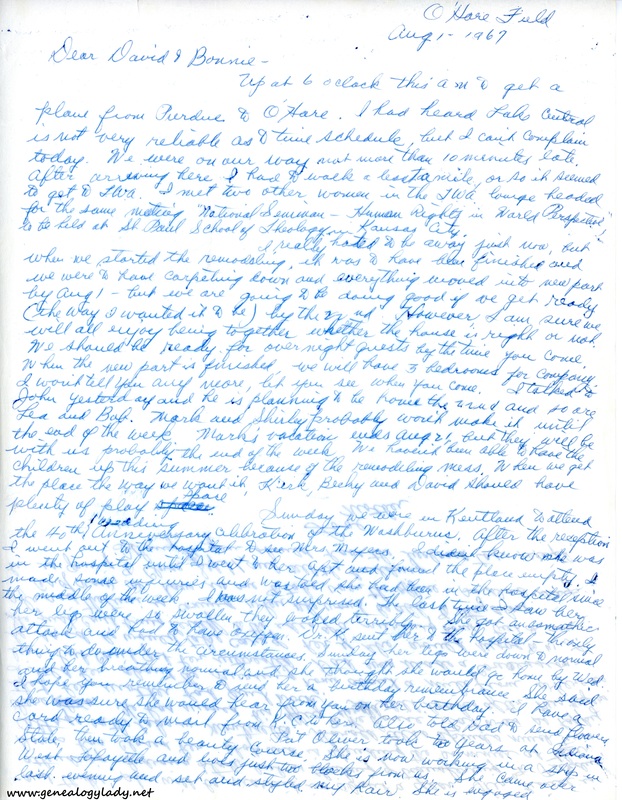 Last weekend we went to Kentland late on Saturday afternoon – and I had just returned from C.R. the day before. We had dinner with Florence and Ray. Jim and Mary Ann and Tom were home. Jim had just returned from his tour of duty in the Air Force. He had been to Japan and had some very beautiful pictures. He is out of service now, but since he took communications while in service is trying to get some kind of job in that field. Mary Ann is going to college in Indianapolis and is wearing a diamond. I think her boyfriend is a medical student. Rita R. is teaching school in Indianapolis and I think Florence mentioned a man one time, so no doubt Rita will become engaged also. Tom is going to St. Joseph College. We then went to LaPorte to visit Janssens. We have been attending all the home football games and believe it or not I am learning to follow the game. Of course, I am not an expert, but can follow what is going on (most of the time). We have tickets to attend the game at Champaign Nov. 4th. 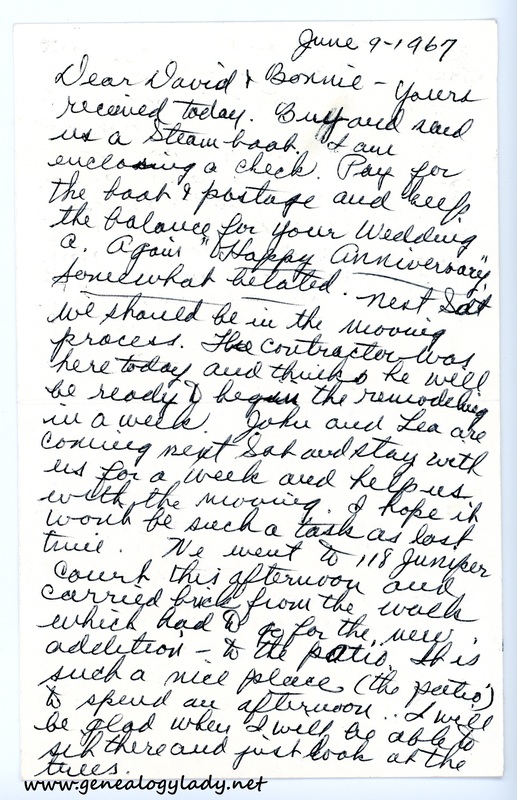 John said he and Bob and Lea want us to come on Friday and spend the entire weekend. They are going to celebrate my birthday which will have passed, but it will be a celebration anyway. If the weather is good I plan to drive to Champaign Tuesday evening to attend “Falstaff.” Bob said I could use his ticket since for some reason he is not going. Bob and Lea have bought a new home and from all descriptions from Bob and John is quite a nice place. Much larger than their present home. They are trying to sell their place at 1608 Rosewood and plan to move to the new house Oct. 28th. I said I was sorry I couldn’t help, but we have promised Mark and Shirley we will keep Kirk and David (I call him roadrunner) while they take Becky and go to Chicago. The last time I kept David he wasn’t still except while eating. Dad has the duty next Saturday and the play we were to see has been cancelled, so it just works out right for us to keep the boys. I haven’t checked yet on transportation in December, but will fly to New York the 6th and probably to Boston on the 9th. I think we are to be finished with our meeting by noon on the 9th. Will let you know definitely when I know more. I paid your fall taxes – another Christmas gift. Also notified the proper authorities here of your change of address to 118 Juniper and you should receive your ballots. 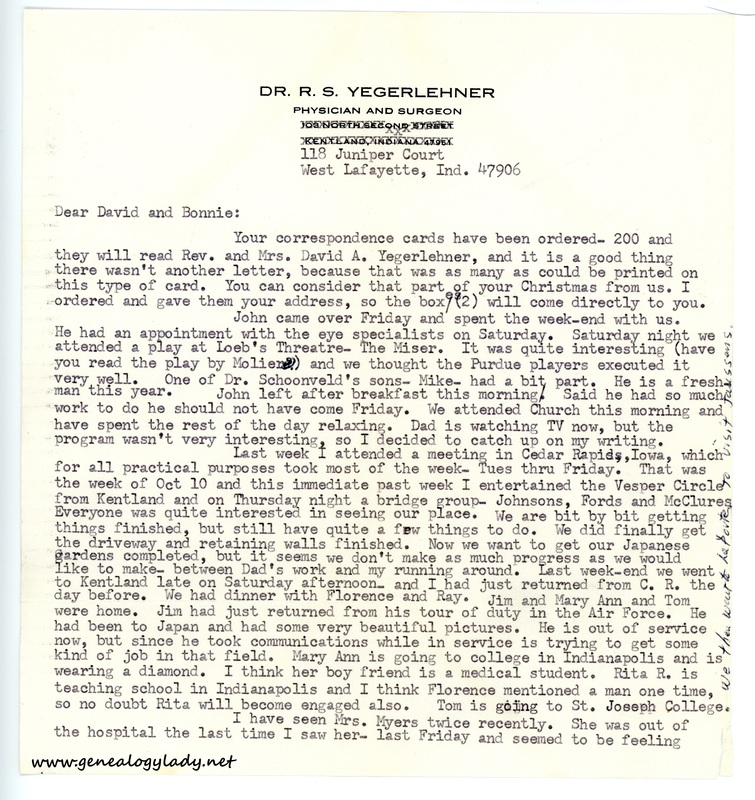 This entry was posted in Genealogy, Yegerlehner and tagged 1960s, Boston, Boston University School of Theology, David W. Yegerlehner, genealogy, Gladys R. (Foster) Yegerlehner, Indiana, John F. Yegerlehner, Kentland, Kirk Yegerlehner, Lafayette, Lena "Lea" (Keith) Gieselman, Mark A. Yegerlehner, Massachusetts, Rebecca C. Yegerlehner, Robert Gieselman, Roscoe S. Yegerlehner, Ruth M. Myers, Shirley (Ward) Yegerlehner on April 11, 2017 by Deborah Sweeney. Your birthday gift is inside, so don’t throw the card away until you have found it. Also you are to give Bonnie ¼ of it, to make your gifts come out even. We went to Earl Park last night to give a program about Switzerland. The teachers of the Earl Park grade school (they now have no H.S.) and the sisters from the Catholic school and the priest from the Earl Park Catholic Church were present. The meeting was held in the basement of the Presbyterian Church. 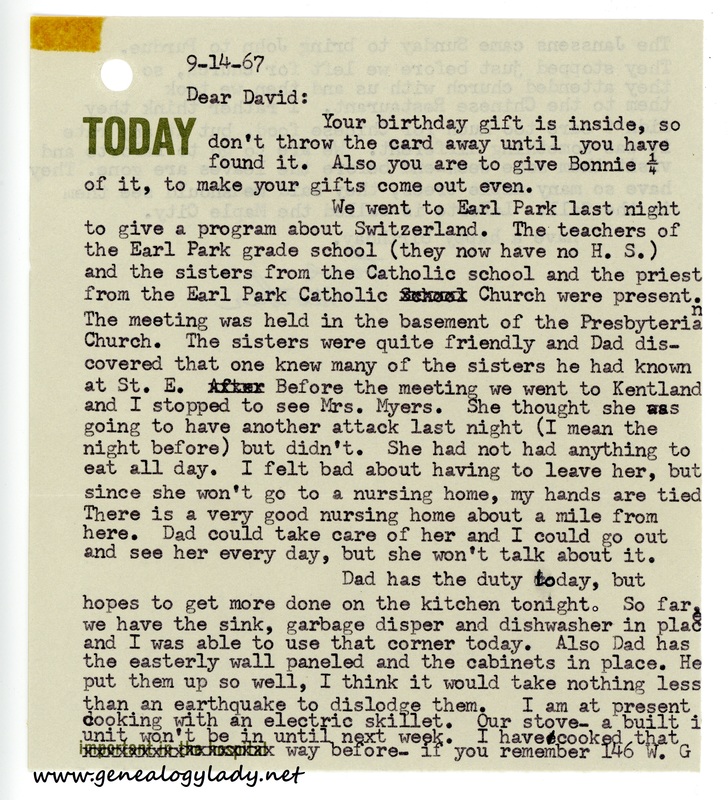 The sisters were quite friendly and Dad discovered that one knew many of the sisters he had known at St. E. Before the meeting we went to Kentland and I stopped to see Mrs. Myers. She thought she was going to have another attack last night (I mean the night before) but didn’t. She had not had anything to eat all day. I felt bad about having to leave her, but since she won’t go to a nursing home, my hands are tied. There is a very good nursing home about a mile from here. Dad could take care of her and I could go out and see her every day, but she won’t talk about it. Dad has the duty today, but hopes to get more done on the kitchen tonight. So far, we have the sink, garbage diser and dishwasher in place and I was able to use that corner today. Also Dad has the easterly wall paneled and the cabinets in place. He put them up so well, I think it would take nothing less than an earthquake to dislodge them. I am at present cooking with an electric skillet. Our stove – a built in unit won’t be in until next week. 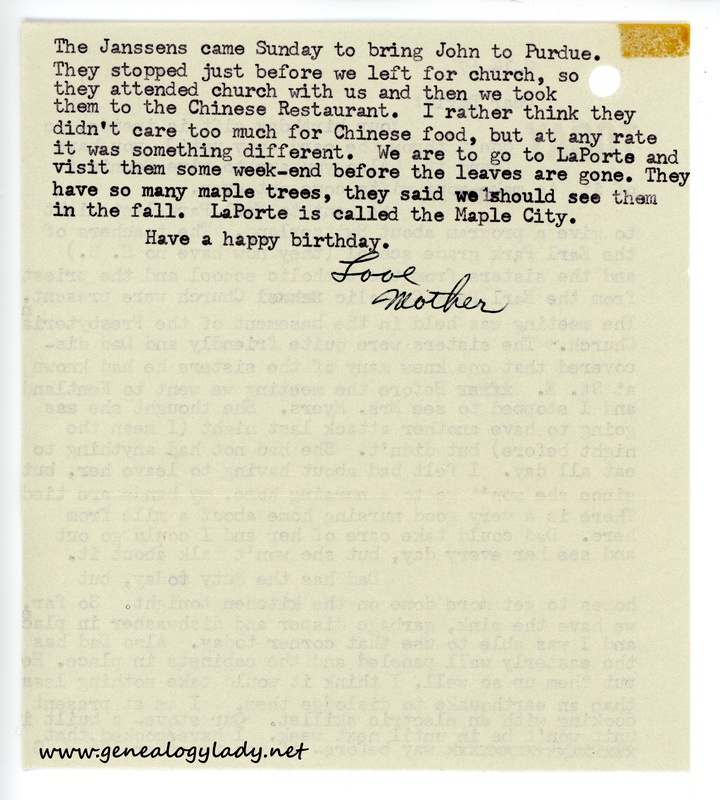 I have cooked that way before – if you remember 146 W. G.
[page 2] The Janssens came Sunday to bring John to Purdue. They stopped just before we left for church, so they attended church with us and then we took them to the Chinese restaurant. I rather think they didn’t care too much for Chinese food, but at any rate it was something different. We are to go to La Porte and visit them some weekend before the leaves are gone. They have so many maple trees, they said we should see them in the fall. La Porte is called the Maple City. 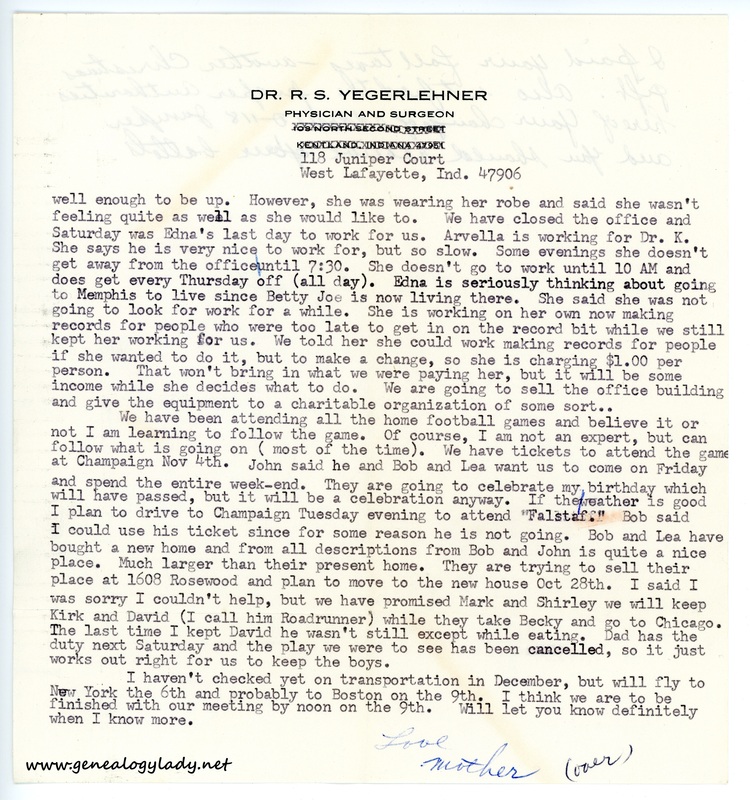 This entry was posted in Genealogy, Yegerlehner and tagged 1960s, Boston, Boston University School of Theology, David A. Yegerlehner, Earl Park, genealogy, Gladys R. (Foster) Yegerlehner, Indiana, Janssen, Lafayette, Massachusetts, Roscoe S. Yegerlehner, Ruth M. Myers on April 10, 2017 by Deborah Sweeney. 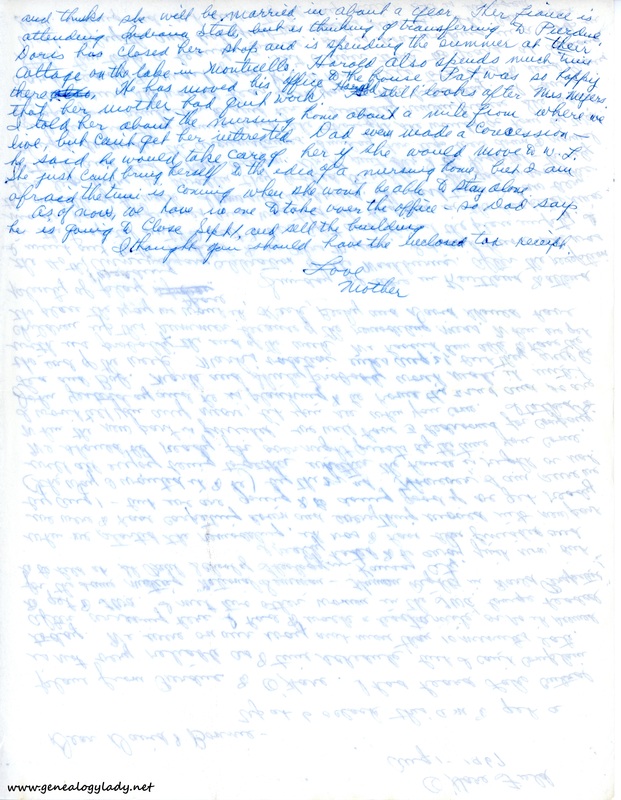 I hope this finds both of you much improved. Sorry to hear your trip to Expo wasn’t what you would have like it to be. But that’s life. I remember one time we were in Kentland and David came down with chickenpox and Dad was in Liberty, Mo. He drove all night to get us and then we started back as soon as we could load into the car. I felt like I had been cheated out of a vacation that year. Imagine having a child come down with a contagious disease in the home of friends and them with a child about a year old. I had on a new knit jersey dress and having to hold David all the way home, by the time we had traveled that far, my dress had a permanent sag in front and had to be discarded, and in times like those, one didn’t lightly discard clothing. We are gradually getting things done. I finally got the living room drapes hemmed and now have the drapes in the room where you slept pinned, but haven’t had a day to get them finished. Brought home some drapery hooks to finish hanging the small drapes (the one you stole the drapery hooks from so we could hang the living room drapes) and found I had bought a different kind, so had to take both drapes down and re-hang them. We are having counter tops made to order at National Homes. We bought a new sink, garbage disposal, dishwasher, stove and hover from Sears. I am waiting for the things from Sears to be delivered this a.m. (I hope). When we bought the things, we could not be given a definite time for delivery – except Friday. John has an appointment at the Clinic this afternoon for his eyes. I am going with him because he will have his eyes dilated and will need me to drive for him. Mark and Shirley came last Saturday. They took Kirk to the Clinic to have some warts burned off. I kept Becky and David. David had a big time on the patio – as did Becky. He thought it was great fun to pick up the acorns, pea gravel and anything that he could lift. Becky suggested that we take him and go to the bottom of the ravine. She was vetoed immediately by grandma. She also enjoyed playing on the patio. She kept trying to find a good hickory nut. We finally found two that were not rotten, but they were green, so she couldn’t have a feast. Saturday is Becky’s birthday. We took her to Sears and got her a new fall coat. It has a zip-in lining and can be used as a rain coat or for not too cold weather. Their selection wasn’t too good, so we decided to wait until the more expensive winter coats go on sale. The one we bought was about $12.00. I looked at some at Ayres one day this week and the prices for a girl wearing 6X (her size now) were $34.00 and up. 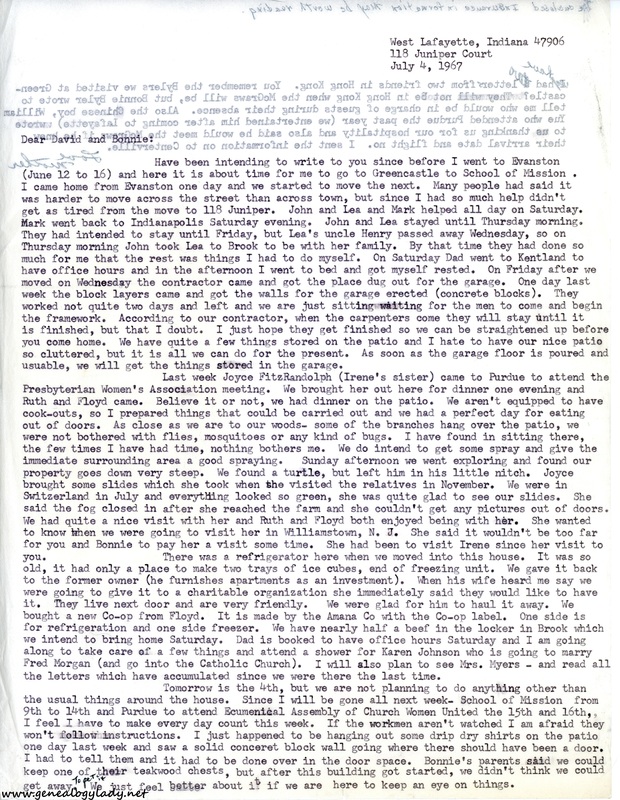 I am sending the magazine you wanted to give to Dr. Beck. I won’t send it first class, so it may be a week before you get it. I think you left a pair of shorts, but I won’t bother to send them. 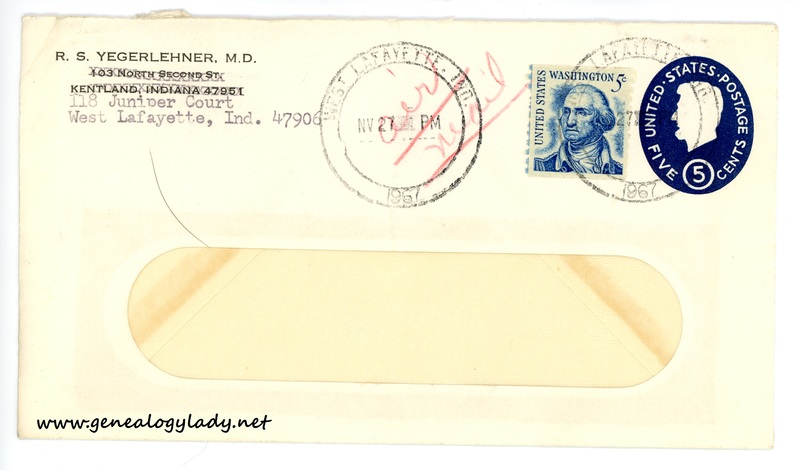 Dark blue – light weight material. Yours? We have our bathroom just about completed. We got tired waiting for the cabinet (which the Company sold that was in stock when we put in our order – and then they had to reorder) and found one we like better at National Homes. I help Dad mount it and after the electrician got the lights hooked up – it contains 6 60 watt bulbs – you can imagine how much light we have in that little room. 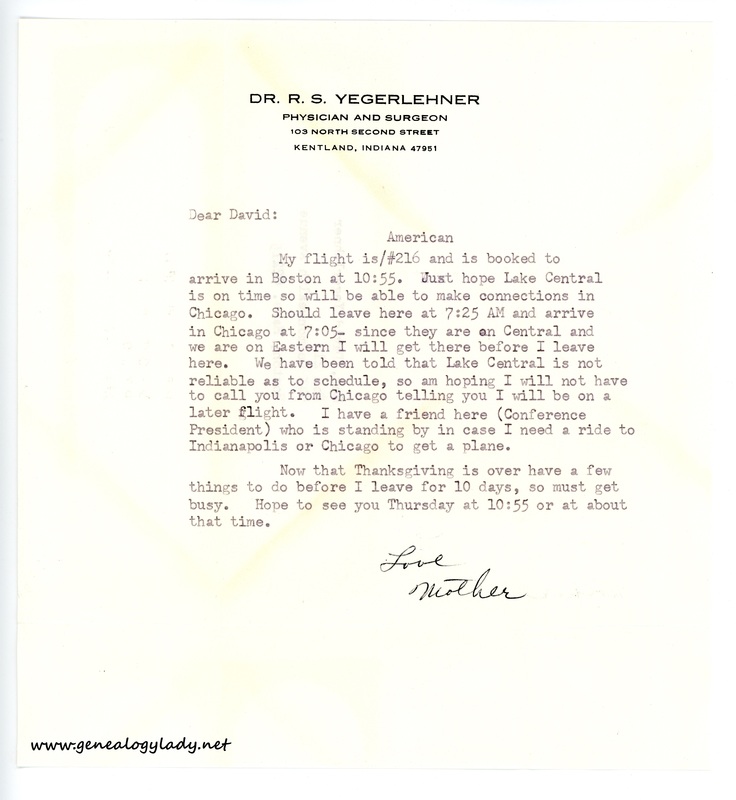 This entry was posted in Genealogy, Yegerlehner and tagged 1960s, Boston, Boston University School of Theology, David A. Yegerlehner, David W. Yegerlehner, Dr. Beck, genealogy, Gladys R. (Foster) Yegerlehner, Indiana, John F. Yegerlehner, Kirk Yegerlehner, Lafayette, Mark A. Yegerlehner, Massachusetts, Rebecca C. Yegerlehner, Roscoe S. Yegerlehner, Shirley (Ward) Yegerlehner on April 9, 2017 by Deborah Sweeney.